A Shelf of Their Own! Quite a few Ichiban Kuji payments are still needed. Please pay promptly if possible so I can begin packing this massive amount of stuff! I also still need these few Pokemon Mate payments! They are quite late now so please get them in! How to pay details are here! Black Kyurem compels you :) His movie was the best I've seen in years. I hope you will all enjoy it too once you see it! I will pay $70 - $80 for a brand new one, $65 - $70 for a used but near mint condition one and $45 - $50 for just the two pieces in good or mint condition. 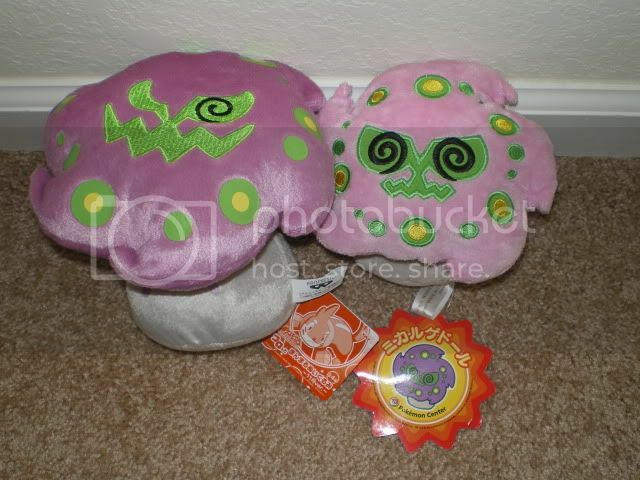 I won this Spiritomb LOOOOONG time ago on ebay, I don't remeber the price nor the seller's ID, but I can't stop wodering if it's a bootie. Question answered, thank you all. Most awesome picture ever, Pikabug updates, questions! I don't post often, so when I do, they tend to be long and multipurpose. XD Sorry guys! Under the cut is the MOST AWESOME PICTURE EVER! Has to do with Pikabug, and Brock and James! And other Pikabug updates. Finally, a question! I'd like to know if there's any Brock and James merch besides the Jakks and Tomy figures, dome figures, and stickers (which I have way to many of). I'm mostly interested in Brock. I love the human merch, and there simply isn't enough of it! While I'm on the line of human merch - the statue/figure of Ash and Pikachu, has it been released yet? There was also one of Cilan and Pansage, I think. I MUST HAVE the Ash and Pikachu one, but I need to know if it's out, and how much it goes for. Does anyone have this Gloom card from the new Pokemon TCG set? Hello everyone! 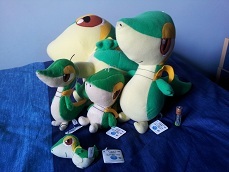 My Snivy collection seems to have gotten a bit out of hand, and as a poor uni student that means sales time! I have a few bits to offer to you today, so hit the cut after the teaser for full details! You can, of course, combine these with anything from my main sales! Looking for a quick buy! These are plush I am looking for that I need by the 25th for my bf's bday. 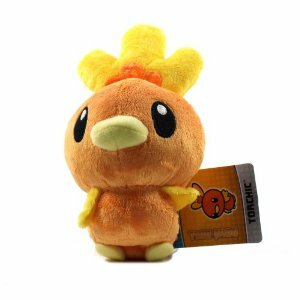 >3< I am looking to buy at least two of these guys for now depending on the prices. 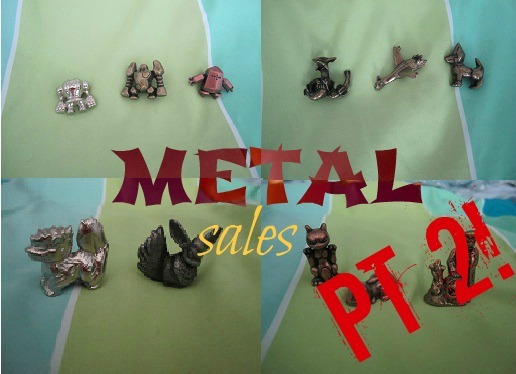 Metal figure sales and auctions part 2!! 7. 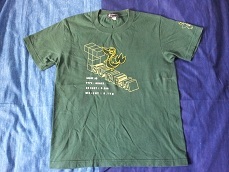 All auctions end on Friday July 20, 2012 at 11:00PM EST. Count down timer here for your convenience! EDIT: ADDED SOME COINS FOR AUCTION. Whoops :l forgot them at first. 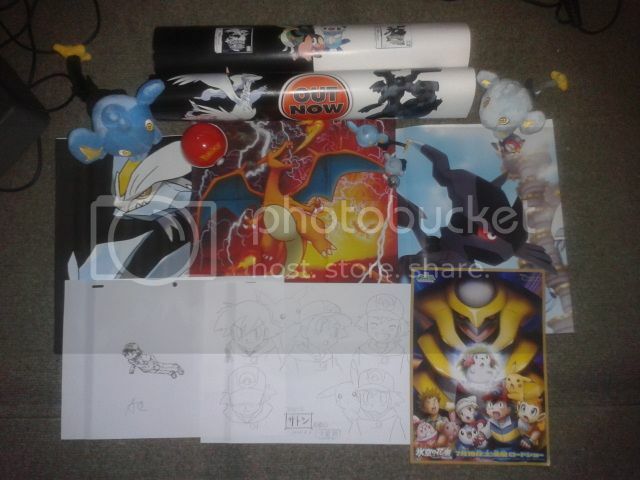 Side note: Anyone that won things in my last auctions for these-- there have been terrible heat waves and storms in my area for the past 2 weeks, and I work every day but Tuesday and Wednesday usually-- so only half of the packages went out last week. The rest are going out Today, Monday July 16, 2012! Sorry for the delay, and thank you for your patience! Epcot Pick-Up || Pick-Up Results and Merch Pics! Also Gets! Hey there, all! I'm back from Florida and I've got a huge update for you guys! First off, I must tell you that it was a huge success... even though I got there to Mitsukoshi a bit later than I had originally planned! 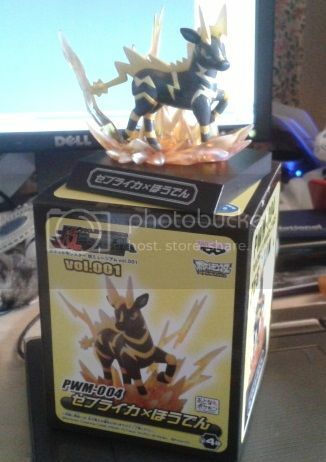 Everyone that asked for a Metagross got one - I was surprised by the fact that they actually restocked them while I was there! - and I was able to successfully pick up mostly everything in one trip! The Japanese cashiers were so helpful with me and very friendly; they even held the other three full baskets as I finished picking up your plush! I had to give them a huge domo arigatou by the time everything was through! Updated 7/18/12 - all refunds sent out! 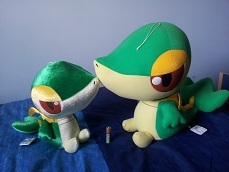 lisul: I couldn't get Cyndaquil, so expect a full refund within the next day or two. Refund sent! furaipan, themessyness & eeveelutiongirl: Either one or two plush that were asked for weren't available, so a partial refund will be on the way in a day or two. Refunds sent! know: I couldn't find Foongus either, so a full refund will be on the way in a day or two. Refund sent! And since I do love pictures... 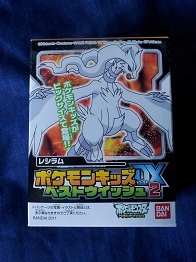 I got camera-happy while I was there, so have a look at the recent Pokemon stuff at Mitsukoshi! I also couldn't help myself, so I had to grab some things as a reward. My wallet was weeping though... I would have gotten more, but darn the limited space in my second bag! To all in the pick-up: A second payment post will be up sometime next week, depending on how quickly I recover from this week's walking and get to the post office to weigh everything. It shouldn't be any later than Tuesday for the final payment post, so look out for it around then! Thanks for reading and looking - until next time!